There are 3 types of neutrinos. 1) electron type 2) muon type 3) tau type. A neutrino may change its type spontaneously. As they travel, they may change from one type to another. This is one of the great mysteries in particle physics. All the latest neutrino experiments around the world focus on the neutrino type changing known as the neutrino oscillations. The 2015 Nobel Prize in Physics was awarded to Takaaki Kajita and Arthur B. McDonald for leading large teams of physicists and engineers to the experimental confirmation of neutrino oscillations. A fourth type of neutrino has never been observed. Latest CMB (Cosmological Microwave Background) radiation measurements by the PLANCK satellite [as reported here and here] indicate that there are only 3 types of neutrinos. N_eﬀ refers to the number of neutrino types. Based on the astrophysical measurements as mentioned above a fourth type of neutrino is highly improbable. The results from the LEP experiments at CERN in the 90’s also indicate that there are only 3 types of neutrinos. Precise measurements of the Z-boson (one of the force-carrying particles of the electroweak force) properties in the CERN LEP experiments (Aleph, Delphi, L3, and Opal) provided clear evidence that the number of fermion generations is 3. Since neutrinos are also fermions (spin=1/2 particles) LEP results strongly suggest that there are only 3 types of neutrinos. 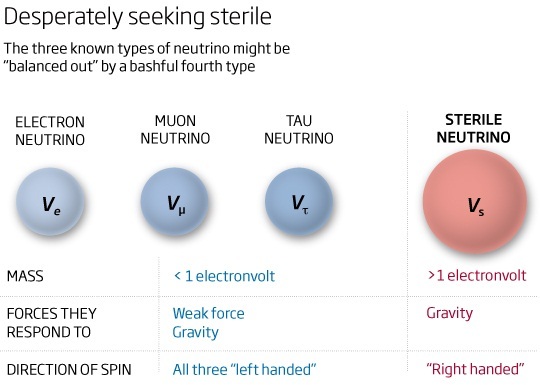 If so, why are the experimental physicists still looking for a fourth type of neutrino known as the “sterile neutrino”? If it exists the “sterile neutrino” would not interact with matter through any of the known forces. Experimental physicists are still looking for hidden “sterile neutrinos” hoping they might partially account for dark matter and also improve our understanding of the neutrino oscillations. The IceCube experiment which measures atmospheric neutrinos with a detector deep under the Antarctic ice, recently conducted a search for sterile neutrinos and found no evidence. The story can be found in this Nature article. Daya Bay nuclear reactors are located approximately 52 kilometers northeast of Hong Kong and 45 kilometers east of Shenzhen. The Daya Bay neutrino experiment consists of eight antineutrino detectors, clustered in three locations within 1.9 km (1.2 mi) of six nuclear reactors. Each detector consists of 20 ton of liquid scintillator surrounded by photomultiplier tubes and shielding. The Daya Bay experiment studies neutrino oscillations. MINOS experiment studies neutrino oscillations as well. Neutrinos produced by the NuMI (“Neutrinos at Main Injector”) beamline at Fermilab near Chicago are observed at two detectors, one very close to where the beam is produced (the near detector), and another much larger detector 735 km away in northern Minnesota (the far detector). In three separate papers—two published individually by MINOS and Daya Bay and one jointly, all in Physical Review Letters—scientists on the two experiments detail the results of their hunt for light sterile neutrinos. “We can’t say that these light sterile neutrinos don’t exist, but the space where we might find them oscillating into the neutrinos we know is getting narrower.” – Alex Sousa (University of Cincinnati) (one of the MINOS scientists). This entry was posted in physics and tagged Daya Bay, IceCube, MINOS, Sterile Neutrino. Bookmark the permalink.